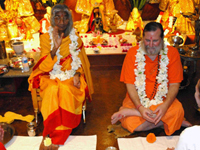 This section contains lots of wisdom from Shree Maa and Swamiji! You will find questions and answers, articles, explanations of specific verses and mantras, and messages from our own Divine Mother, Shree Maa. We hope you enjoy and find value in all that this section has to offer. Peruse at your leisure! The night is dark, cold and raining. A few devotees are lined up around Napeshwar with offerings of milk, yogurt, ghee and honey. This is no ordinary night, it is Maha Shivaratri. Shree Maa’s Indispensable Wisdom on How to Defeat the Asuras! Are you tired of battling the negative tendencies in your life? You know, the ones that keep repeating themselves over and over — like aggressiveness, fear, pride, shame. This delightful article about our beloved Shree Maa was recently published in the Indian newspaper Deccan Herald. It portrays a beautiful picture of Shree Maa and Her profound, yet simple, teachings about how to experience divinity in our lives. Read about Her life of service and Her teachings on Karma and the responsibility of the Guru. The family is the altar upon which human life is measured. Cultivating a spiritual approach to family life is Dharma. Shree Maa and Swamiji present expert advice in living the Dharma of a spiritually rich family life. This is a short article quoting Ramakrishna’s advice on how to obtain peace.